I have to say, and I do this honestly, that as far as presuppositional methodology goes, you cannot beat this book! 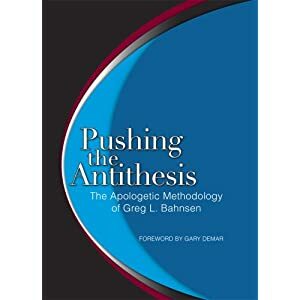 For those seeking to understand the method and apply it I would say this: Pick up a copy of Greg Bahnsen's Always Ready for the understanding (or Jason Lisle's The Ultimate Proof of Creation if Bahnsen seems a bit academic), and a copy of Pushing the Anthithesis for applying. Pushing the Antithesis (composed by Gary Demar), systematically goes through each precondition of intelligibility (The things we need to assume in order to function in the world) and shows why the nonbeliever is living a fallacy and the Christian is living consistently. It does so with invaluable quotes from representatives of the nonbeliever's worldview and ends each section with a Bible study on the particular topic. In addition there is a study guide for small group discussions and applications. For those seeking to learn how to debate/evangelize using Presuppositional apologetics this is a must!